Chimney Dampers – STOP THE ENERGY THIEF !! You could be losing HUNDREDS of DOLLARS every year with your homes precious heat rising out of the chimney. A chimney dampers job is to seal the chimney airtight when it is not in use. Heat naturally rises and when the fireplace is not in use , it acts as an upstairs open window. Traditional throat dampers are typically cast iron plates that often deteriorate, rust, or get jammed and off track. The metal to metal connection doesn’t cut it. A damper that seals tight on the top of your chimney keeps that outside out and the inside in. That cold breeze you feel from your fireplace, much of that is cold air being drawn down the flue while your heated air is rising up it. Safeside Chimney professionally installs top mounted dampers eliminating 90% of winter heat and summer cooling loss that leaks past your current damper. It also eliminates downdrafts and keeps moisture and animals out of your chimney and home. Moisture in your chimney causes unwelcome odors and leads to deterioration of bricks and mortar. 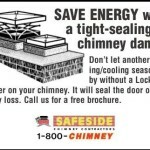 The Lyemance Top-Sealing Damper works year round to protect your chimney. That’s why thousands are installed each year. Call Safeside Chimney today to find out more about a Chimney Damper for you home!